JusTea has provided me with Purple Mint for the purposes of providing an honest review. I received this product at no charge to me and received no other compensation. I had never had purple tea before. JusTea’s website is quite informative about purple tea. Purple tea comes from the same plant as all other teas (green, white, black oolong), but it’s a variety that produces dark purple leaves instead of green. The neat thing that I learned from JusTea’s website is that purple tea changes colour! It becomes a purpley pink with the addition of some lemon juice. Purple Mint came to me in a resealable paper bag that’s lined with foil. 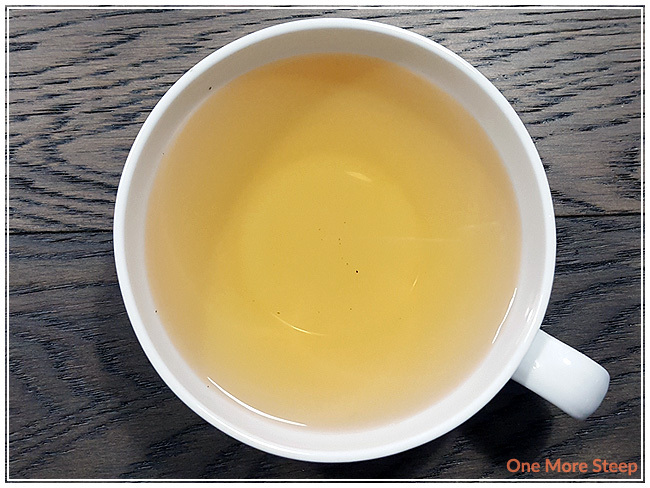 The mint aroma is very strong, there is no question that this tea includes mint in the blend! Because of the strong peppermint and spearmint combination, I wasn’t able to smell the purple tea on its own. Purple Mint consists of Kenyan Purple Tea, peppermint leaves, spearmint leaves, and rose petals. JusTea recommends steeping Purple Mint in 190°F (88°C) water for 3 minutes. I steeped mine in 185°F water for 3 minutes. Purple Mint steeps to a lovely yellow colour. The mint flavour is strong, and I find that the purple tea taste is quite similar to green tea. There’s some vegetal notes to the tea, as well as some buttery qualities to this tea. 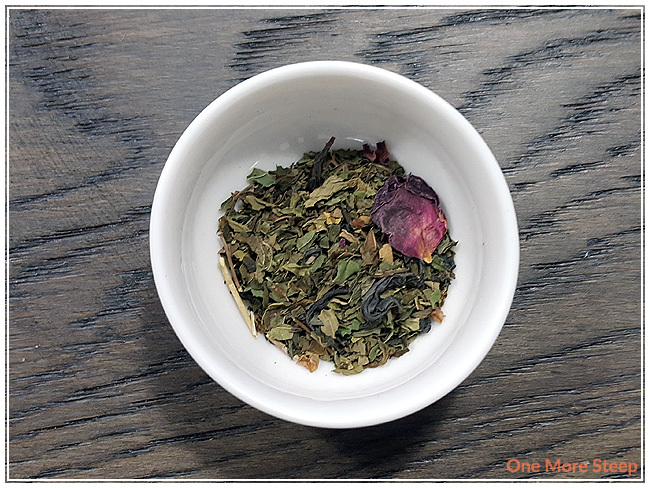 The mint flavouring is definitely first and foremost in this minty blend though, I think mint is just such a strong flavour that it shouldn’t be a surprise that it’s strong in a tea blend as well. What peeks through from the purple tea is tasty though, and reminds me a lot of green tea. 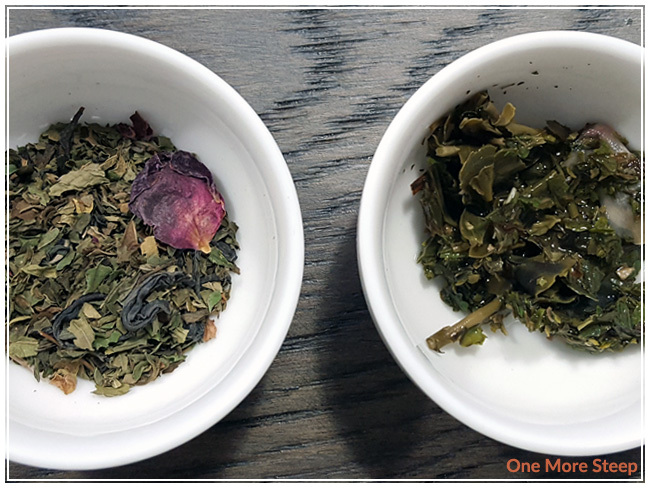 I do wish that JusTea mentioned the processing type of the purple tea (I would put money on it being processed the way green tea is), since purple tea refers to the variety whereas green/white/black/oolong refers to the production process of the tea. 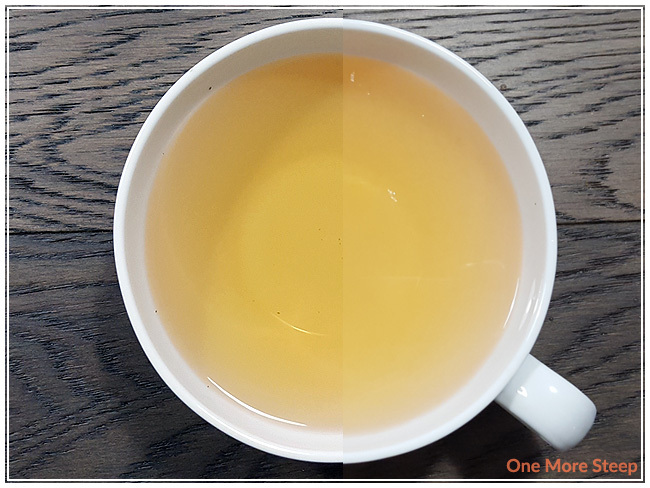 I squeezed a bit of fresh lemon juice into my cup of tea and was a bit disappointed that the colour didn’t change as much as it did in the video on JusTea’s website. I think the edges are bit more pink? But it’s hard to tell. 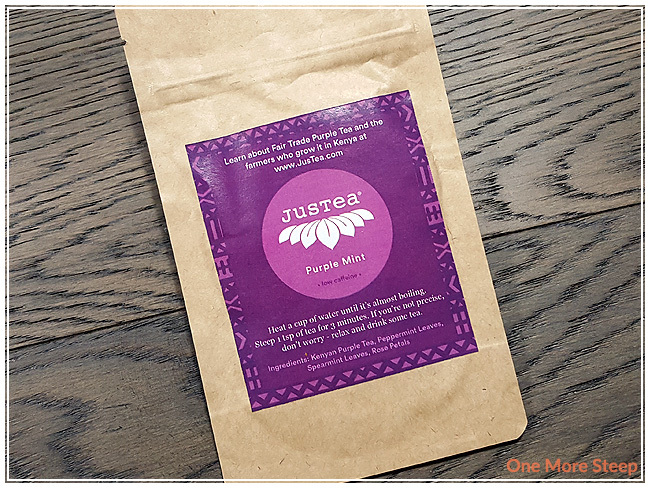 I do have another bag of tea to try from JusTea (which is the straight purple tea), so I’m hoping that will have more of an adventurous colour change. The lemon does brighten up the flavours, and actually make the mint flavour even stronger. If you’re opposed to the sourness of the lemon, a dash of sugar or a spoonful of honey will fix that right up. JusTea recommends resteeping their purple teas at least once. I tried twice, because I’m a rebel like that I found that the first resteep tasted very similar to the initial steep. The second steep was a lot milder, and I found that the mint flavouring wasn’t as strong as the first or second steep. I think JusTea was right on the money with the recommendation of one more steep. I loved JusTea’s Purple Mint. 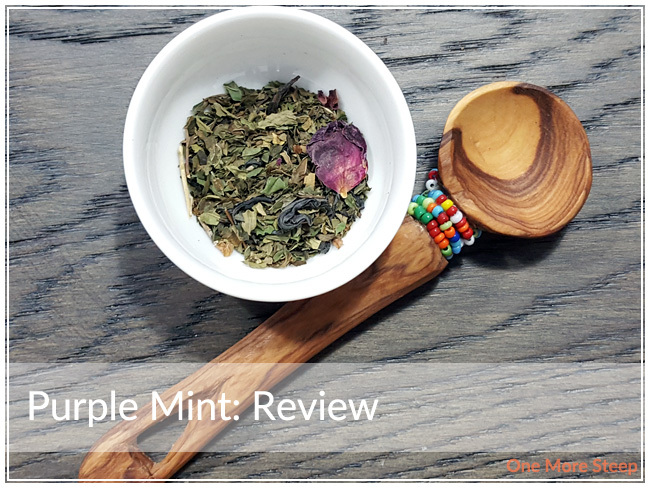 I really liked the mint flavours in this tea, and found that the purple tea reminded me a lot of green tea (which I love!). I was a bit disappointed that the colour didn’t change as vividly as I was expecting it to, but it’s something that I can live with since I don’t typically put lemon into my tea. The buttery qualities of this tea are enjoyable, and I think it tastes really good with or without the lemon.